ANATOMY NOTE: The hand is big enough to cover the face when the fingers are spread. Don't check! Somebody near you may smack your own hand into your nose. You can't escape the need to use blocking type shapes to draw these either! There is more than one way, like I promised see? 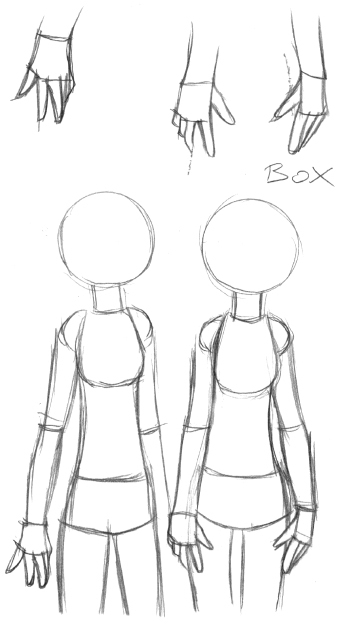 The box and the circle are the two basic ways to draw hands, and feet. But first, I'll tutor you about hands. Draw them with box and circles that don't necessarily have to be real circles or squares! Don't judge the box method too harshly okay? It doesn't always make a sharp look so don't worry about how it'll look when you're using the method when drawing girls. I myself prefer the box method. There isn't really a gender to hands, but if you want that detail I'll give it to you. 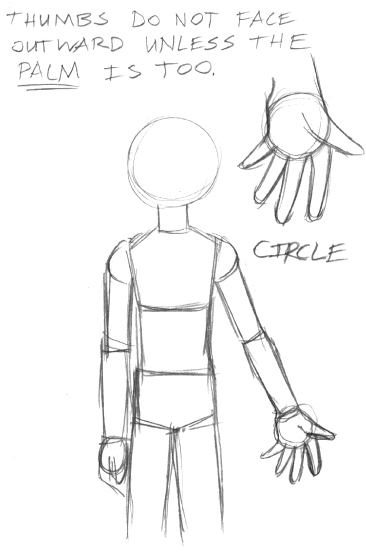 When you draw with the circle or box methods, for feminine girly quality just draw them slimmer (boxes turn into rectangles and circles into ovals) and longish in contrast to the male's hands. Other than that, a guy's hands are built bigger and thicker than a girl's so have it in mind. 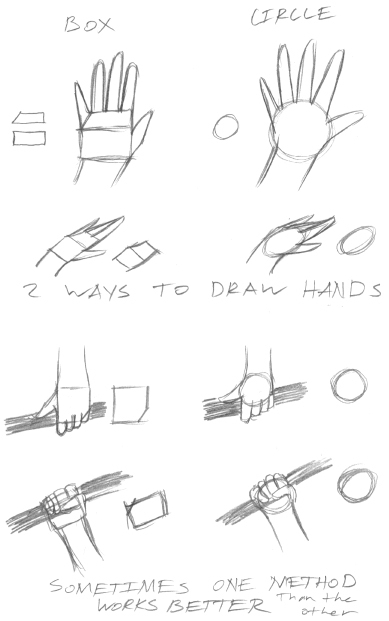 To practice the methods draw the box and circle when you think about the angle or perspective of the hand when you're looking at it. You have to pay attention to where the thumb is. If the thumb wasn't so important or in existence then no one would have trouble drawing hands that look right. If you look at your own hand, the thumb is placed near the base of your palm, closer to the wrist than the rest of your fingers. So there is always a gap between the thumb and the pointer finger! Your thumbs when at the sides relaxed are visible to the viewer from the front. At other times, the thumbs are right next to your hips/thighs. BE CAREFUL! Always remember which side of the hand the thumb is on. When you're drawing any pose with the hand somewhere in view as part of the pose, the thumb better be where it's supposed to be in order to be called anatomically correct. When the palm is shown as seen in the example to the right, the thumb is outwards and the pinky is nearest to your hip/thigh. If you're not sure about anything, a reference picture (e.g. magazine, JC Penny/KOHLS catalog) or looking at the pose you want in the mirror works good.